Everyone has had technology issues. Whether it’s yanking paper out of your printer, restarting your computer for the fifth time this week, or struggling to open certain kinds of files, no law firm operates free from technology challenges. 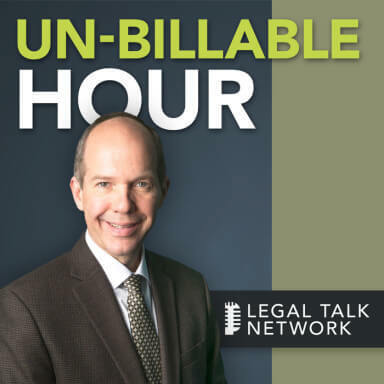 In this episode of The Un-Billable Hour, host Chris Anderson talks to Tom Lambotte, CEO of GlobalMacIT, about the effect different technology mindsets have on legal businesses. Some of these mindsets include ignoring smaller tech problems, avoiding issues until they are severe, and lawyers acting as their own IT experts. Ultimately, technology can save you time and money but only if you look at it with a healthy mindset. Tom Lambotte founded GlobalMacIT in 2007. He is renowned nationwide as an author, speaker, trusted IT advisor, and cutting edge, successful provider of the #1 complete end-to-end IT solution for Mac-Based Law Firms in the world. Special thanks to our sponsor, Answer1 and Solo Practice University. Christopher Anderson: Welcome to The Un-Billable Hour, the Law Practice Advisory Podcast helping attorneys achieve more success. We are glad you can listen today on the Legal Talk Network. I am your host Christopher Anderson and I am an attorney with a singular passion for helping other lawyers be more successful with their law firm businesses. My team at How to MANAGE a Small Law Firm and I work directly with lawyers across the country to help them achieve success as they define it. In The Un-Billable Hour each month we explore an area important to growing revenues, giving you back more of your time and/or improving your professional satisfaction in one of the key areas of your business. As an attorney myself who has built and managed my own law firm in Georgia and New York City, I now get to work with hundreds of law firm owners to help them grow professionally and personally. I start with the fundamental premise that a law firm business exists primarily to provide for the financial, personal and professional needs of you, its owner. Now before we get started I do want to say a thank you to our sponsor, Answer 1. Answer 1 is a leading virtual receptionist and answering services provider for lawyers. You can find out more by giving them a call at 800-answer 1, or online at HYPERLINK “http://www.answer1.com” www.answer1.com. And today’s episode of The Un-Billable Hour is The Legal Technology Mindset. One of the topics I cover in these shows is the physical plant, and the physical plant of your law firm includes all the tools that the people who work in your business need to run the production line, even if those people are just you, that is to get the work done. There are about 16 jobs in every single law firm business even if you are doing a lot of them, and you shouldn’t be doing most of them. Some of these tasks you must delegate to people and some, in fact more and more, can be handled by technology. There are a very small number of things that are the highest and best use of your time. From the rest you must liberate yourself. It is axiomatic that the most value you can bring to your business while you are working in it is the least amount you could pay somebody else or something else to do that thing competently. By that I mean to your standards. And my guest today is Tom Lambotte. Tom works with attorneys who use Apple computers in their law firm businesses. His company is called GlobalMacIT and they take care of everything IT related, letting their clients focus on building their business. His company is in their 10th year and is the only company in the world that invests a 100% of their resources supporting Mac-based law firms with five or more users all across the country. And we are going today to discuss the Technology Mindset Scorecard that he has created on how your mindset towards technology can affect your overall law firm operations and business profitability. We aren’t here to convince you that you must use a Mac to have a successful business, but it is important to think about technology as a key part of your physical plant that will empower you to unleash the value that you and your people can deliver to your clients and your business. So let’s get started with The Legal Technology Mindset. Tom Lambotte, welcome to The Un-Billable Hour. Tom Lambotte: Thank you Chris. Christopher Anderson: Thank you for being here. I really appreciate it. So first of all, my introduction of you was really brief. I gave a long introduction of the topic, but a very short of you. I did say that you run a business called GlobalMacIT. What does your business actually do for law firm owners? Tom Lambotte: So the fancy answer is that our mission is to provide leadership and direction to transform law firm operations and boost their profits by leveraging the technology. The simple answer is that we take over everything IT related for a law firm and systematically remove the bottlenecks within their operations and their systems, improve all their security and workflows, and then focus on ways to increase their productivity by implementing the best technology solutions. Christopher Anderson: Okay. So the bottom line is you take the business owners out of being the IT managers? Tom Lambotte: Exactly, and then put them back at doing the higher ROI activities they should be working on. Christopher Anderson: Now, I was fascinated when I learned about you and one of the reasons I asked you to be on the show was that I am a Mac guy. I have been a Mac guy since literally, no kidding, 1984. The school that I went to had a Macintosh initiative back then and I have never looked back. And so my law firms that I have run have been Mac focused, never Mac only, but you are a Mac only IT group. How big a market is there really — like are a lot of law firms using Macs now? Tom Lambotte: So most people when they hear what we do, they think that my market is tapped out when we have got a 37 Mac using law firms out there. There’s actually a lot more than most people would think. The ABA has an annual Legal Tech Survey titled TECHREPORT and last year the numbers showed that 8.1% of attorneys are using Macs in their practice overall and 15.5% of solos are using Macs in their practice. So when you compare that to the total numbers of attorneys, that’s about 75,000 Mac using solo attorneys and about 5,000 attorneys and firms with two or more attorneys, and this is just continuing to grow. I hear all the time about schools and the graduating classes, how high the percentages of Mac users and these are all the new attorneys coming into the field every year. So I am definitely hopeful for the future. Christopher Anderson: Yeah, that’s great. I am so happy that it has only taken 32 years for Mac to become mainstream. Actually it has been happening a lot for the past ten years. So when you are working with prospective law firms, as we have talked about, this show is going to really be talking about the legal technology mindset and about this Mindset Scorecard that you have got. You don’t come in talking about routers and network cables and operating systems, you are talking about mindset. It’s not what normally I think a lot of our listeners come to expect from an IT company. Tell me a little bit about that, how you come to this methodology? Tom Lambotte: So the average IT company, when we first started up I did what everyone else was doing and I spent five hours doing a detailed network analysis on-site and looking under there in the network closet and doing all that stuff and then quoting specific hardware that they need and all this, but that wasn’t what’s important. What I feel and what I have learned is the most important is that your mindset creates your behavior, and just because a client is using Macs in their practice does not mean that they are a good client for us. So what I have learned over the years is that having Macs is just the minimum system requirements. Kind of like an old videogame where it says 1 megabyte of RAM needed, but you know you really need 4 for it to work. So what we figured out is in order to provide the most value to our clients we need to find the right clients that have the right mindset, because the mindsets that exist within the attorney and partners and their staff is one of the most valuable resources. Entrepreneurism was described by Jean-Baptiste Say as taking resources from a lower level to a higher level of productivity and greater yield. So the different range of mindsets that you can run into are a resource, but if you are not conscious of where they are, they are very likely at a very low level of productivity. And so once I get a good feel of where their mindset is, are they an attorney that’s trying to use their Macs for seven years and upgrade the RAM and the hard drive to get a little bit more time, so they just spent three hours upgrading a hard drive instead of doing billable work, right, that’s half the cost of the Mac. So someone with that mindset typically is not a good client for us, because they are not really trying to leverage technology in the right way to maximize their kind of results in their business. Christopher Anderson: And actually that’s an interesting take, so what you are basically saying is, listen, if you prospective client don’t have a mindset to maximize your value to the business. Like I was saying I think in the intro, I was saying that one of the axioms of business is that the most value you can bring to your business is the least amount you could pay someone or something else to do that job. So for instance, if you are answering the phone when someone calls that doesn’t have an appointment to speak with you, you are doing the job of a receptionist, and a good competent receptionist might cost you $15 an hour. And so that’s the most value you can bring to your firm being a receptionist is $15 an hour, instead of $300, $350, $450 that you might be able to bill as an attorney. And what you are saying I think and what you are seeing is that if people have that mindset that they need to answer their own phone or they need to, as you said, install their own RAM to save another six months of life on a computer, they are probably not giving the most value for their time in their law firm, which might end up making them a client that doesn’t pay their bills. Tom Lambotte: Yeah, you get a lot of the wrong fit clients. I believe one of the most important part of sales is to find who is not a good prospect for you. Most people work so hard trying to get everyone to sign up, they don’t focus on saying, hey, who is not a good fit, because those are the clients that end up being 80% of the stress, 80% of the headaches, the ones that only sign up for your service, because they have to and they have no other choice. As opposed to the clients that say, hey, this makes sense. This seems like a really smart decision. I am going to get a lot of value out of this, so let’s hire an expert, outsource this, get it off my desk and have them strengthen my overall team, as opposed to something Micky Deming discussed on last month’s call from Kahuna Accounting is people deal with accounting just to do the bare minimum, and when you have that mindset, things are going to be set up in a certain way that you can pretty much count on all the time. So by finding the right mindset and helping the client see where they are and where they want to go, we can help really find the best clients. And it doesn’t mean they have to be perfect, I mean, of course not, but if they can say, hey, this is where I am now and this is where I want to go, then we can come back and say, hey, this is what we do best and we can help you raise that score, what kind of value would that add to your practice, and then it’s an easy discussion at that point. Christopher Anderson: Yeah. And I am glad you brought up Micky and Kahuna, because the truth is, the saying goes, that the way you do anything is the way you do everything, and on this show, yeah, Micky has talked about it. We have had lots of guests and lots of topics where we have talked about indeed hiring people, to be associates, to be paralegals, to be receptionists, like I just talked about, using technology or using other resources like outsourcing accounting, outsourcing discovery sometimes, outsourcing transcripts, outsourcing whatever you can, and these are all really the same thing. And you keep using the word mindset, and I think it’s time that we actually define that for the listeners. Like when we are talking about mindset, we are talking about the way they approach everything, is that what you are talking about? Tom Lambotte: Exactly, yeah. And most people have never attempted to quantify or kind of score their mindsets and so how can you improve something that you can’t measure, it’s very difficult. What I have developed in creating this Legal Technology Mindset Scorecard is a tool that we can use that kind of looks at eight of the mindsets that have a very significant impact on the success of the firm. And so by helping them put a number on kind of where they are, first, they might realize like, wow, I didn’t realize that I had that mindset and now that I think about it I can see how that’s impacting my practice. Christopher Anderson: So you have created this thing called the Legal Technology Mindset Scorecard that you just mentioned, but what I would like to do is talk about it in two ways. First of all, just like if you can discuss a little bit about how attorneys can benefit from using it, and then I would like to actually go through each of the eight and what they are and what they mean to the law firm. Tom Lambotte: Sure. Just to be upfront, I would love to go through all eight, but I don’t think time will allow, so I think we can dive into one. I am going to be writing a book on all eight mindsets and there’s a lot to cover, so I would rather dive deep in one instead of lightly touch on all eight. Christopher Anderson: Sounds like a good plan. Tom Lambotte: Again, mindset creates behavior. It’s very easy to score external things that you see, gow many client referrals am I getting, what are the firm revenues, how much are we spending on IT services, but what’s more important is what drives and what is behind behavior. So this process is a tool to take your initial subjective emotional response. So maybe, for example, it’s how do you feel towards technology, and it allows you to translate it into clear thinking communication and action. And so by taking the qualitative experience of how you feel towards technology and creating a quantitative measurement, this enables you to improve different areas of your practice. So it’s a simple scorecard with scores of 1-12 on each of the eight mindsets, and you go through and you score yourself, where am I now and where would I like to be. And once you have the score you can then evaluate where your current mindset falls, and once you have scored yourself, the decisions and changes you need to make become much more clear. It’s kind of one of those things that once you have seen it, you can’t un-see it. And most people have never taken the time to really grade themselves, like hey, is this mindset that I have helping me or hurting me. So that’s kind of what the purpose of this tool is. Christopher Anderson: Yeah. I know we are not going to go through all eight, but in full disclosure to the audience, I have seen them all, and I won’t talk through them, because I want you to keep the suspense going for your book. But what I will say is that reviewing them, you call this a Legal Technology Mindset, but really at the end of the day this is legal business mindset, this is legal entrepreneurship mindset, these things really could speak to — in this show we talk about marketing and we talk about sales and we talk about people and hiring and being able to recruit and retain and train you’re a team of people. We talk about the production line and how they get the work done. We talk about the physical plant, which this show is a little bit about, the tools that they use to get the work done. We talk about the money and the metrics. And then we talk about personal development. But all of these things apply to each and every one of those parts. This is really some great thinking that you have done with this, and I think that going through this Scorecard will really help lawyers to do a self-analysis on where they are entrepreneurially thinking and where they want to be and where their gaps are. Do you see that as a utility for it? Tom Lambotte: Absolutely. I mean, only one of the eight, I am sure as you have seen, is really technology-specific. And again, that’s why our ideal prospect is not a Mac-based law firm. Our ideal prospect is really an entrepreneurially-minded attorney. It’s the business attorney that’s looking to grow, because there we can add a tremendous amount of value, because they look to maximize all the resources, whether they want to maximize their marketing or their sales or their staff productivity, technology is just one of those levers that if they choose to focus on, invest and maximize can have a huge impact. So they are using their accounting and their numbers as a tool as opposed to something they just have to deal with. It’s the same thing as technology, same thing as sales, same thing as marketing. And so you look at each one of these levers and if you can apply these mindsets and kind of approach these towards it, you are going to build a very successful firm. Christopher Anderson: Great. So I will tell you what, what we are going to do is we are going to take a break here in just a moment and when we come back I am going to ask you to just go a little bit deeper as to why only one of the eight is about technology and then we are going to dive deep, like you said, we will dive deep into that one coming up after the break. But for right now we are going to take a break and hear from our sponsor. Advertiser: Is your firm experiencing missed calls, empty voicemail boxes and potential clients you will never hear from again, enter Answer 1, Virtual Receptionists. They are more than just an answering service. Answer 1 is available 24×7. They can even schedule appointments, respond to emails, integrate with Clio, and much more. Answer 1 helps make sure your clients have the experience they deserve. Give them a call at 1-800-answer 1 or visit them at HYPERLINK “http://www.answer1.com/podcast” answer1.com/podcast for a special offer. Christopher Anderson: And we are back. I am talking to Tom Lambotte of GlobalMacIT and we are talking about the Legal Technology Mindset. When we went to break we had begun talking about the Legal Technology Mindset Scorecard that Thomas developed and is writing a book about, and we were noticing that of the eight mindsets, and we are not going into all eight of them, but only one of them really talks about technology and the rest are more entrepreneurship or business-oriented. And I wanted Tom to just describe a little bit more about why only — like it’s called the Technology Mindset Scorecard, but only one of them focuses on technology. Why did you feel like it was important to explore these seven other areas? Tom Lambotte: So the title is still a work in progress, just to put that out there, because it has definitely rambled on my mind saying, is that the best thing to call it. One of them is values technology, the other are things such as people maximizer, responsive openness, strategic thinking, seeks expert counsel, entrepreneurially-minded attorney, proactive, and future-driven are the other seven mindsets. And the reason that these are important again in doing what we do in GlobalMacIT, we have really positioned ourselves to be the white glove, five-star experience of, what we are focusing on this year, shifting our company from being an IT company, who solves your printer and email issues, what you think of support when you call IT, to really being a premier, kind of strategic consulting company for law firms who happens to do what we do through technology. And so in order to find the best type of clients, they need to have successful mindsets, and that’s why all these things, seeks expert counsel, if someone doesn’t value that, if someone is a do-it-yourselfer that’s going to spend a lot of time being a jack of all trades and they only call an expert when they have absolutely no other possibility to do so, they are not going to value our input. They are going to spend six hours on Google on a Thursday afternoon to try to fix their printer instead of going to an expert right off the bat. Christopher Anderson: Yeah. And what you will also find and what the listeners really need to focus on is that that’s you, because the way you do anything is the way you do everything. You also won’t value your expert services, and these are the lawyers who will also be discounting to their clients, writing off bills, not sending bills, because you cannot be in integrity with yourself. If you don’t value expert counsel on the outside that means you won’t value your expert counsel that you give to others. Tom Lambotte: Exactly. So that’s why only one is related to technology. Technology is just a lever, it’s just a tool. What’s more important is how their relationship is going to work out; whether people are going to value what we do for them and really put it to use, that’s not dependent on what Macs they have and how fast their Internet connection is or if they are using Clio or Rocket Matter, that’s all really irrelevant. It goes back to a concept towards marketing, most people approach marketing by trying to apply tactics. So they go, oh, we are going to do a Facebook campaign. Oh, we are going to run Google ads. But they never stop to really define their strategy first. And so this is the same thing. So if we want to maximize technology and turn it into this amazing profit-generating tool, we have to get the strategy right, and in order to get the strategy right we have to work with clients who have the right mindset to do that and really enable and fully power that tool, if you will. Christopher Anderson: So let’s do that then, let’s take that dive and talk about this values technology, and by values it’s not technology about values, it’s whether or not the client, whether or not the attorney, the law firm owner values technology highly. You have labeled this mindset values technology, can we just go a little bit deeper into that now, what are some symptoms or what are — how would you describe someone that has a low score on value and technology versus a high score and what it means to their business. Tom Lambotte: Yeah. So when you are going through the Scorecard, the lowest section is that you view technology as an expense that is to be minimized at all costs and you say if it ain’t broke, don’t fix it. This is driving your car until it breaks down as opposed to taking it in for regular oil changes. It’s negligence until you have no other choice but to fix it. And I have come across this many times over the years. We actually had a client who signed up for our services, this was a couple of years ago, wrote us a check, he was all in, he wanted to switch from PCs to Macs, we were going to do it all. We cashed his check, started, and he disappeared, completely fell off the face of the planet. We tried reaching out to him, silence. Four months later he calls us back, he says, okay, I am ready to go now. And his dad, who he was taking the firm over for, said, we have got these PCs, they are still working, if it ain’t broke, don’t fix it. In those four months two of those PCs went down, one of them three times, the other one completely, so one of his staff was down for four days until they got the system back up. So he went through those experiences and he is like, okay, that mindset of if it ain’t broke, don’t fix it is not going to work. It’s not going to get me where I want to go. So he came back in more committed than before and now he is on the complete other side. So if you have that mindset if it ain’t broke, don’t fix it, you are not going to be able to leverage technology. Christopher Anderson: Right, it will leverage you at that point. Tom Lambotte: Yeah. And the only way it’s addressed is reactively, when you have no choice, and then you are going through a tremendous amount of suffering that’s completely unnecessary. The highest score is a score 10-12 is you view technology as an investment; a massive profit lever inside your firm that you are always looking to maximize. And I tend to see this mindset from the kind of younger firms, with a younger median age, if you will. They are more comfortable with technology. It doesn’t mean I only see those in the younger ages, but it’s more typical. And again, when you have those growth mindsets of success you are aware of the productivity of your staff and you are looking for ways to improve that. And so when you have that mindset you are going to see technology as just one of the many ways that you can do that. So again, there’s one thing having a case management solution, Clio for example; however, I hear from people all the time that have it and they say, oh, I don’t like Clio, it’s not working. And then I say, okay, did you just write a check and sign up for Clio and think everything was going to start working, that’s how most people rolled it out. So they never invest in the time. Christopher Anderson: The gym membership mentality. Tom Lambotte: Exactly. I am going to steal that analogy, by the way. But yeah, they sign up for it and then they get upset at Clio six months later because their productivity hasn’t increased, and I go, okay, what kind of training have you done? What did you do for the initial roll out to make sure you got buy-in? So there are specific processes to get to that. So that’s kind of the high end and low end and then the middle of the pack mindset, so a score 4-6 is you will do anything you can to extend the life of your computers and only buy new ones when they fail. So that’s kind of one step above like if it ain’t broke, don’t fix it. You are still doing it yourself. You are still investing a lot of time yourself to kind of deal with the technology. Does that make sense Chris? Christopher Anderson: Yeah, yeah, absolutely. Yeah, it’s barely a step above, but yeah. Tom Lambotte: And the next step above, and this is really interesting, so this is a score 7-9, you have no problem spending money on quality technology and understand it provides your practice with a solid foundation. So this team tends to be in a successful, kind of traditionally successful firm, if you will, and they say, okay, computers are a cost of doing business. So they have no problem writing a check, buying new computers every three years, but they don’t necessarily focus on leveraging that and say, hey, how can I really use these computers, how can I turn these into tools as opposed to something my staff just has to work on. Christopher Anderson: Right, we need desks, we need pens, yeah, I guess it’s 2016 we need computers, so buy some of those too, but not understanding the profit leverage. Tom Lambotte: So it’s not a failing mindset, it’s “successful” here, but they are not really pushing the boundaries. They are not using it as a tool. It’s like, yeah, I have got the service, it’s good, we are happy with it. There’s no major problems, but there’s no major benefit. It’s kind of right in the middle. Christopher Anderson: Yeah. What I would like you to do then, because this is how everybody when they are going to a tradeshow, when they are going to a computer store, when they are talking to people, a lot of times the sales pitch is about like, yeah, this only costs you $60, $90, $120 a month, but it will save you so much more and therefore it’s really profitable. And I think to a large extent that goes in one ear and out the other. What are like some top hits, when you say that they should see it as an investment and a profit lever, what are some top hits for how they should see technology as a profit lever in their firm? How does it really return on that investment? Tom Lambotte: There’s a lot of different ways. First, just the quality of the computers. If you are working on a computer that’s more than three years old, you need to buy a new computer, because it’s costing your staff everyday, the one minute, the three minutes to turn on a computer, to launch an application, to OCR large PDF document, if it’s taken three minutes as opposed to 30 seconds, which the current technology can do, it’s like the dripping faucet. It adds up tremendously. It’s not a giant pain where it’s like, oh yeah, our law firm didn’t lose data, we weren’t down for two days, but it’s that dripping faucet that adds up continuously that makes a major impact. So for one just making sure you have got modern hardware. Christopher Anderson: Yeah. Like what I am picturing when you are talking about this is actually I am picturing, and I have been in this law firm, like I am picturing a law firm where there’s a line of four or five $65 an hour, $45 an hour paralegals and associates waiting for a copier that keeps getting jammed, like it’s not broken, it’s fine. I know this isn’t Macs and this isn’t computers, but it’s sort of the same thing, right. It’s only costing them — they are standing in line maybe five minutes instead of 30 seconds, but if they do that four times a day, that’s 20 minutes a day. They do that five days a week, that’s an hour-and-a-half. They do that every week of the month and now we have got five hours of someone that costs us $65 an hour, but I can bill out at $195 an hour. Now we are talking money, like that’s more than the copier lease for the entire month. Tom Lambotte: Yeah, it adds up fast. So it’s those little things, when you look at in the scope of one year, five employees, you are like, whoa, I am actually spending $15,000 a year for them to sit by the printer waiting for it to get fixed. And then people don’t take the time to quantify those things because it’s not painful enough. It’s not a blaring pain point. It’s not a huge check that they weren’t planning on writing, but labor is the number one expense for the majority of law firms. The legal profession I think has the — I think it’s the fourth most profitable industry and they also have the fourth highest labor costs. So if you are not diligently focusing on your labor costs and where you are bleeding time, you are bleeding tens of thousands of dollars and not thinking and approaching and leveraging technology in this way is huge. I will give you a simple example. We had a law firm where there was an attorney who didn’t know how to edit PDF documents, so simply deleting a page out of a PDF. So she would save it on to her flash drive, walk across to the office, interrupt the office administrator, plug it into her computer, open the file, delete the page, save it back on to the flash drive and walk back. Do that step five times a day, 20 days a month, and they were bleeding time, completely unnecessarily because they didn’t have the right solution. We said, hey, let’s do a little training on PDF management. We brought the whole team in there and now she doesn’t need to do that. And again, it takes an average of 22 minutes to get back to the task in hand when you are interrupted. So it’s not only the attorney there, but also the office manager that’s interrupted, so that’s 44 minutes lost every single time. Looking at those things, and again, that’s why we focus on two sides of the coins, so the first is the bottlenecks, where are the things where you are wasting time, where are the workflows that are just plain stupid, things like that. I mean, there are so many examples like that I could list, and once you fix those, boom, that bottleneck is addressed. And then once you address all the bottlenecks, what we focus on is stabilizing the patient. Once we have come in and stabilized the patient and plugged all the holes, then we can get to the front side and say, okay, where can we boost productivity, and that’s where there’s all the different tools and solutions and all the VPNs that people come to hate, because they are unreliable and they are slow, so moving to the cloud, that’s where the tactics come in as a part of the overall strategy. Christopher Anderson: Sure. So what I would like to do as we come up towards the end of the show is, we have been talking about technology and how technology can be a profit lever in a law firm, how really having the more success-oriented mindset in this one area, not to mention the other seven, can really reap rewards inside the law firm. But I would like to just take a moment to look at the law firm owner, because I know there are some people listening to this show right now that are thinking, you know what, they are right, and investing in technology is important and I am going to do that. And so you know what, I have had a Mac for 20 years. I have installed memory. I am technology proficient, so I the law firm owner am going to be the driver of investing and leveraging technology in my law firm. I am going to wear the IT hat as the owner. And I read a white paper that you have written about this, and I thought it was fascinating, so I would like, if you can, let’s just spend like five minutes talking through what issues you see with the owner wearing the IT hat. Tom Lambotte: Sure. So there’s four kind of core concepts that I have built this kind of discussion, which I have had many times like you said, I wrote the white paper. And so the first concept is — so what you want to do is the problem with wearing the IT hat, so wearing the IT hat, like you said, is the solo attorney or the small firm owner. I mean, when you start up a firm, you are in the grassroots for the majority of people, unless you have a ton of money sitting around and you are comfortable starting up, but most people start up in a grassroots kind of thing, which is a good thing in my mind. But that also means that initially you are not hiring people to help you out with anything, you are doing everything on your own. And the problem specifically in my field using Mac using attorneys is there were a lot of people that think, oh, Macs are easy, so I will just take care of IT myself. But the problem is that the Mac operating system is easy, the whole technology that affects your firm, it’s like the iceberg, 10% above, that’s the Mac operating system, 90% below is the networking, the firewalls, the security, the employee setup, and all these different things. So the four concepts that help you quantify the cost of wearing the IT hat. The first one is just a simple time analysis. So simple numbers, okay, like we talked about a few minutes ago, it takes 22 minutes to get back to the task at hand every time you are interrupted. So first thing you want to do is quantify how many times do I help out for IT related things. If Susie’s printer doesn’t work, does she walk into your office, stop the work you are doing and you get up and go help her with her printer, so all those kind of interruptions. So you have got the time you are spending dealing with little issues, also the time you spend running updates, and when do you do this, you are doing this at night, you are doing this on the weekends, because you typically have a hard time justifying it during prime billable hours. So instead of sacrificing your billable hours, you are sacrificing your family time. Personally, I have a very high value on work-life balance. I work 8:30 to 4:00 p.m. everyday, and I don’t work on weekends, I don’t work evenings, and that’s because I have set those barriers, and I know in the legal profession it’s very taxing. So one of our things we focus on is how can we improve that for our clients, and this is a big thing. So we say, hey, if you can just stop dealing with that, that’s going to free up a lot of time, that’s going to give you more free time and rest and time with your kids and your partner, et cetera. The second core concept is we will just deal with it, and can you guess where this is going, Chris? Christopher Anderson: Yeah, I am seeing this at the bottom level of the values technology mindset, like okay, it’s broke. Tom Lambotte: Yeah. 100% of the times we have taken over IT for a firm, for someone who is taking care of IT internally, there is always a lot of what I call suffering in silence going on. So what happens here is the staff knows that the head attorney is swamped, has more work to do than he has time, and so the last thing they want to do is interrupt and bother that person when they have a little email issue or a little printer issue, or they don’t know how to OCR a document or something small. So instead of telling them, like hey, this is a problem and it wastes time, they just sit there and deal with it and suffer in silence. Again, 50 minutes per day times five people over 20 days a month is six hours of lost productivity. So what is your fully burdened labor rate, and not do you pay someone $25 an hour, you usually add about 30% on top of that for all the other costs, so six times $40, $240 lost. Christopher Anderson: And that’s just on the cost side, and where you really should be looking at is on the unbilled time side. What could you bill these people out at and then you get really upset. Tom Lambotte: Yeah. And that adds up extremely fast, so we will just deal with it. The next concept is what I call the hobbyist principle, and I believe very, very strongly on this, and again, this actually falls on the mindset, when you spend time being a jack of all trade, you can’t ever be a master in anything. Think about how much time and money was spent towards becoming an attorney, and no matter what you do if it’s not the one thing you do best, you are a hobbyist. Can I self-represent instead of hiring an attorney? Sure. But if I brought it up to any attorney who knows what they are doing, they can talk me out of that pretty darn quick. I know many attorneys who have give me examples of clients that, man, if they would have called me six months ago, I could have saved them tens or hundreds of thousands of dollars, because we would have done the right thing right off the bat, as opposed to trying to me playing a hobbyist attorney and represent myself and messing things up left and right. We have cleaned up for a tremendous amount of attorneys. That’s where the idea of stabilizing the patient has come from. What I find when attorneys are playing IT guys, they will quite often create Rube Goldberg devices, you know what those are? Christopher Anderson: Google it, just Google it. Tom Lambotte: Just Google it, yeah. It’s the zipper that takes 80 steps to unzip a sweater. It’s kind of the machine for that. So there is way more complexity and it’s just a nest of pain that we have to unravel. So that’s the hobbyist principle of that kind of idea. And the final one is just simple ROI, what is your return on spending your time doing IT work. You talked about this earlier, and I think it’s a regular point that’s discussed on this podcast, but if you can pay someone $150 an hour to do something and it takes them one hour as opposed to you spending four hours googling around and trying to figure it out when your billable rate is $250, it’s simple math. But the problem that happens when people take care of their own IT is that there’s no line item on the balance sheet. So there’s a false belief. They go, oh, this is great, my IT bill last year was only $1,200. This is awesome. But they don’t calculate the last ROI. They don’t calculate the cost against their family. They don’t calculate the loss in productivity from their entire staff having to deal with all these issues. So that’s my kind of core idea there with the hidden costs of wearing the IT hat. Christopher Anderson: Clearly. All right, so we have got about 30 seconds left. Can you give a quick hit to the listeners of, this has been I think fantastic information, but in about 30 or 45 seconds just tell them what steps can they take, can the attorney law firm owners take to improve their use of technology? Christopher Anderson: Those are the dangerous ones. Tom Lambotte: That are the dangerous ones. There are so many things that every firm should have in place that I would say 95% of the time they don’t have these things when we first come on, just security concerns. I mean, the list goes on and on. Christopher Anderson: So how can they get their hands on the Legal Technology Mindset Scorecard then? Tom Lambotte: They can go to HYPERLINK “http://www.globalmacit.com/scorecard” globalmacit.com/scorecard and I am going to create kind of a sign up form or try to have something ready by whenever this goes live, but at a minimum I will have a sign up form so I can keep in touch. I have spent about six months last year developing and building this, so now that I have got the thing, I have got to package and find a way to kind of get it out to people. So that’s where they can sign up to get more information and I might be able to give kind of early access to some people. I don’t know the details, but that’s where they can start to at least keep in touch about it. Christopher Anderson: Fantastic. So that wraps up this edition of The Un-Billable Hour, the Law Business Advisory Podcast. Our guest today has been a pleasure, it’s been Tom Lambotte. Tom is also the author of ‘Hassle Free Mac IT Support for Law Firms’ and ‘Legal Boost: Big Profits Through an IT Transformation’. He also has a forthcoming book being published by the ABA Law Practice Division titled ‘Macs-in-Law’. So you have had a brother-in-law, you have a sister-in-law, now you have ‘Macs-in-Law’. You can learn more about Tom by going to HYPERLINK “www.globalmacit.com” www.globalmacit.com. His Twitter handle is @globalmacit. He is on Facebook at GlobalMac and LinkedIn at Tom Lambotte. And of course this is Christopher Anderson and I look forward to seeing you next month with another great guest, as we learn more about topics that help us build the law firm business that works for you. Remember you can subscribe to all the editions of this podcast at HYPERLINK “http://www.legaltalknetwork.com” legaltalknetwork.com or on iTunes. Thanks for joining us and we will see you again soon.